Morocco’s exotic charms are steeped in history, delighting jet-setters keen to whisk their way from the Sahara’s epic sand dunes to the lively shopping arcades found in white-washed Fes. All over the country colourful posters excitedly promote Morocco’s bid to host the World Cup in 2026. And it looks as though urban planners across the country are preparing Morocco for a big win: Casablanca’s waterfront is undergoing a massive face lift, Rabat will soon play home to the tallest skyscraper in Africa, and the luxury resort mecca of Marrakech is slated to open a W Hotel, which hug the Four Seasons Residences that are currently under construction. On my recent road trip of Morocco, organized by leading luxury tour operator Sahara Experience, I quickly realized there are plenty of unique luxury accommodations to experience. From urban resorts in Casablanca and Marrakech, a design-tastic traditional riad in Rabat, and an unforgettable luxury tented camp in the Sahara only accessible by camel caravan…Morocco’s sweets suites are waiting for you. With magnificent ocean views, Four Seasons Hotel Casablanca blends cool sand-coloured architecture with modern Moroccan elegance. Only five storeys in height, the intimately scaled hotel features 185 spacious guest rooms, including 29 suites – most with private balconies overlooking the ocean or gardens. As most arrive into Morocco from the airport in Casablanca, the Four Seasons is a perfect place to rest and relax while fighting that inevitable jet lag. The city’s finest hotel is a sublime urban oasis featuring impeccable design lines, a trilogy of world class restaurants, and a restorative destination spa. 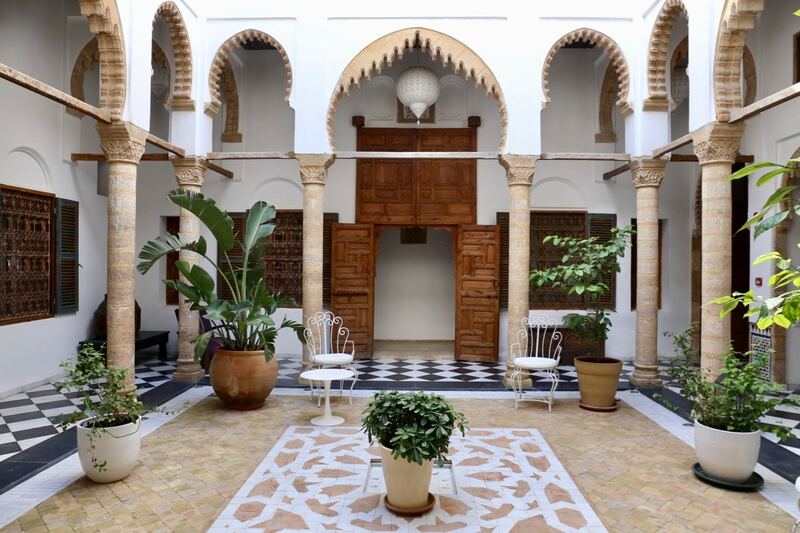 For those looking to experience an overnight stay at a traditional Moroccan riad head to the recently opened Dar Shâan located in Rabat’s ancient Medina. The intimate 11-room Andalusian house has been restored and enlarged and features magnificent stone columns, chiselled arches, wooden ceilings, heavy carved doors, grilles, and marble tiles. 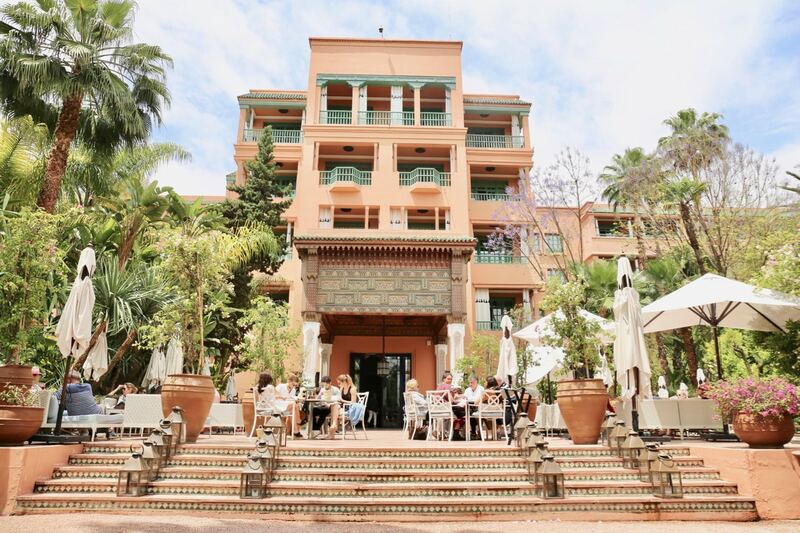 Dar Shâan’s most charming features are its quiet central courtyard filled with lush potted plants, chic meets petite Moroccan restaurant, and spacious rooftop outfitted with a pool where you can enjoy jaw-dropping views of the city while soaking in the sun. 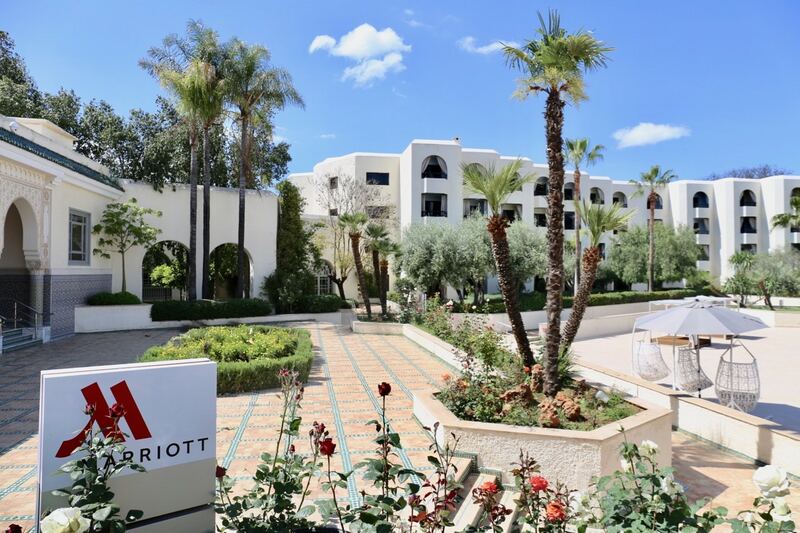 Set in an extensive parkland, the historic Fes Marriott Hotel Jnan Palace offers guests a lush urban oasis far from the city’s famously smelly tanneries. The focal point of the hotel is its massive pool, which is outfitted with chic patio furniture that rest on eye-catching Moroccan tile floors. The interior garden is filled with fragrant rosemary bushes, handsomely maintained orange and olive trees, and sweet smelling rose bushes. Fes Marriot Hotel Jnan Palace’s stylish suites boast a mix of traditional and modern decor and offer feather beds, marble bathrooms, and intimate balconies. The hotels fine dining Moroccan concept L’Herbier de L’Atlas offers a jaw-dropping interior where you’ll find a local quartet serenading guests who feast on tagine, couscous, and rosewater-scented sweets. 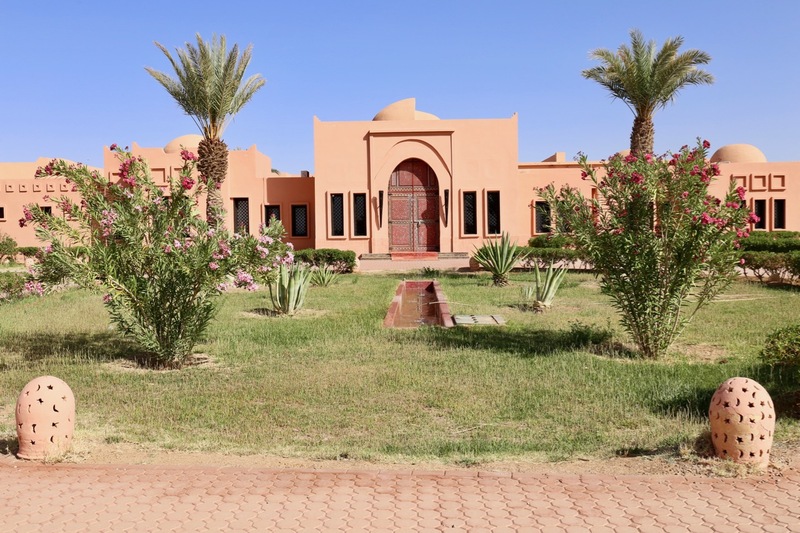 If you’re looking to rest and relax after the exhausting 8 hour drive from Fes to Erfoud the pretty pink Palais Masandoia offers a desert casbah-inspired experience just a stones throw from the dunes of Merzouga. The intimate boutique hotel features just ten rooms and five suites (distinguished by a private patio), which are built around a central courtyard. 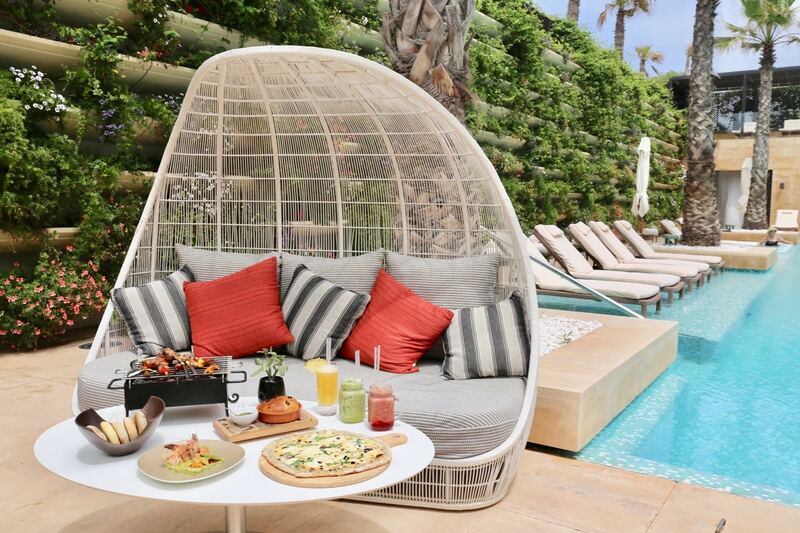 A massive palm tree ebbs and flows throughout the day at the hotel’s central meeting place which offers a chic bar, Moroccan lounge and intimate al fresco restaurant. Rugs and carved furniture brighten the hallway to each suite…swing open the heavy studded wooden door and you’ll find a high domed ceiling, comfortable king-sized bed, armchair and coffee table. Large bathrooms are outfitted with blue mosaic tiling, a huge soaker tub, plush towels and fluffy bathrobes. On a hot day you’ll find most guests gathered around the hotel’s lagoon-style outdoor pool, tanning under palms while relaxing on lounge chairs and comfy day beds. 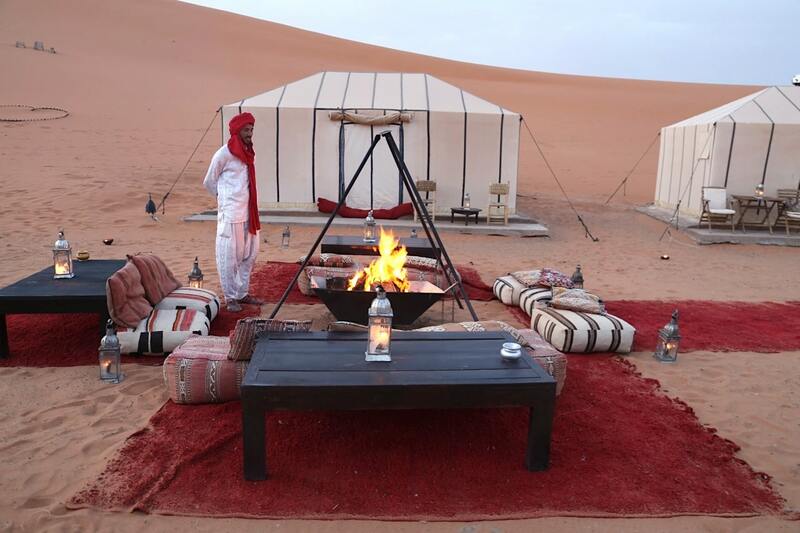 There are scores of tour companies that operate tented camps in the Sahara desert just outside of Merzouga. Overnight guests are typically dropped off at 5pm and greeted by a Berber guide and caravan of camels. The trek usually takes an hour and offers a fun way to experience the Sahara’s epic sand dune scenery. Once off our camels our shaky legs tip toed up a wind-swept sand dune, jaws-dropping as we looked down at Merzouga Luxury Desert Camp below. The camp features five private accommodations (outfitted with comfy king bed and bathroom separated by a curtain), a tented dining area where breakfasts and dinners are served, and a central fire pit surrounded by a choir of plush pillows…an ideal spot to sit back and enjoy star gazing at night. Opened in 1923, the legendary La Mamounia Hotel stands on the site of a residence that, in the 18th century, belonged to the son of the Alaouite sultan Sidi Mohammed. All that remains of that residence is the magnificent 32 acre garden, planted with olive and orange trees and containing a pavilion that is presumed to have been built by the Saadian ruler in the 16th century. The original hotel was designed by Henri Prost and Antoine Marchisio, who achieved a pleasing mix of Art Deco and Moorish styles. Many famous people, including Winston Churchill and Richard Nixon, have stayed here. La Mamounia is considered one of the world’s finest luxury hotels and today features all the trappings of a modern urban oasis. Wander through the property and you’ll find fashion boutiques by Dior and YSL, a famous French pastry shop filled with a rainbow of macarons, a serine spa, massive outdoor pool, and trilogy of fine dining restaurants serving up elevated fare inspired by traditional Moroccan, French and Italian.